I have discovered what the cookbook means by “Light Desserts.” I am not pleased. They snuck a diet food chapter in on me! This is, possibly, the greatest offense this book has committed yet. Between that and the being in Argentina, this is the only recipe from this chapter. If there were anything else interesting, I’d have made time in October or catch up in December but I don’t believe in calorie cutting and I’m sure as hell not taking diet advice from a cookbook that recommends margarine. Fortunately, my freezer runneth over with frozen fruit, and frozen fruit is great for last-minute dessert things. So I started our sabayon prep by tossing frozen blueberries into a pan to heat up. The sabayon itself was super easy and quick to make. 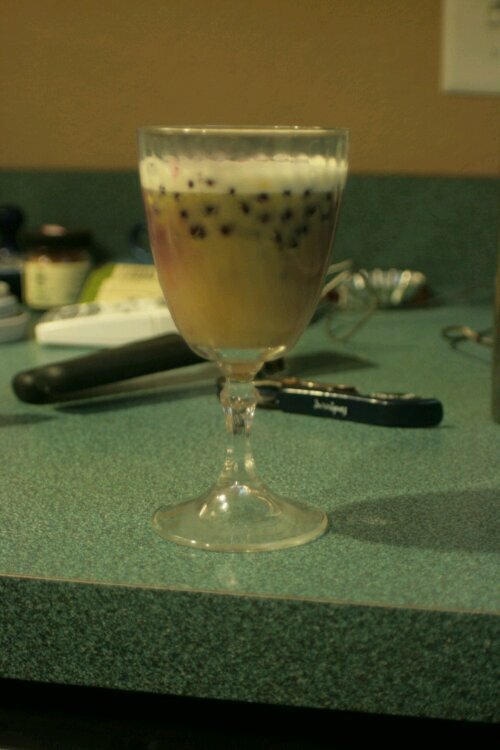 It’s pretty much just sweetened eggs, milk and booze. 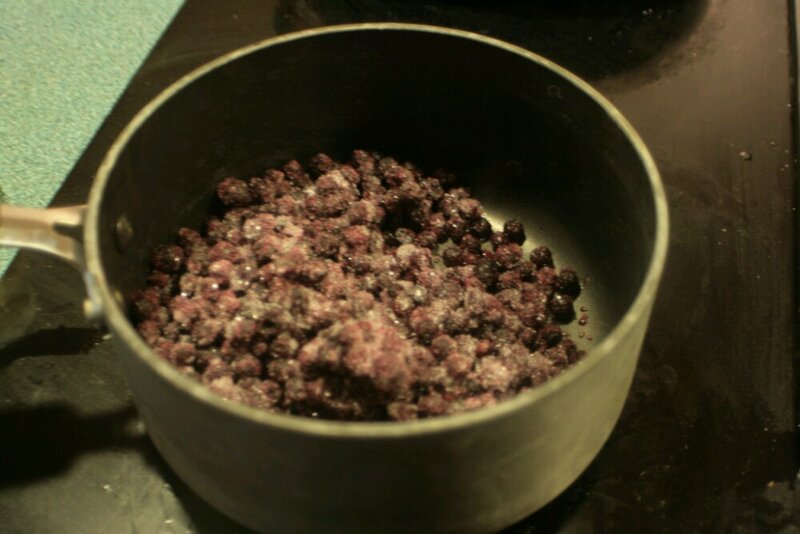 The hardest part was making up for the part where I didn’t remember how brilliant prepping in the measuring cup had been last time, and tried making a go of it with the glass bowl. No handle, and you have to whisk the contents while it floats in a pot of simmering water until the sauce thickens. I put up with about five minutes of that before stopped to switch over to a dish that actually made sense for the circumstances. The recipe says you’re done when the sauce is thick enough to coat a spoon. 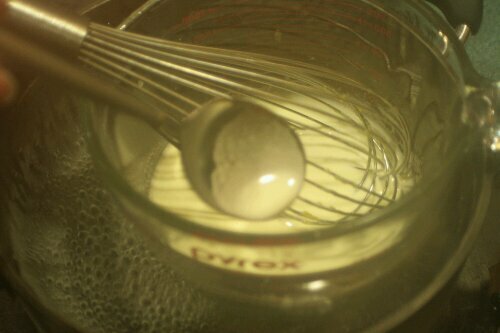 Having a spoon within reach makes the whisking-while-testing process much, much easier. I served everything in a cordial glass. The blueberries turned the sabayon a less-than-attractive color, but for a plain sauce the book tried to pass off as dessert, I think this presentation worked fairly well. Not to mince words, but I’d never make this dessert again. It was easy, it also wasn’t anything I’m ever going to crave, or fancy enough to be worth doing for itself. The Strawberries Romanov did the booze-fruit combo much better, and there’s something unsatisfying about drinking your dessert when it isn’t a milkshake. 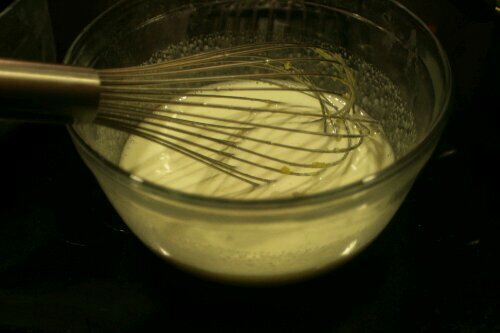 I’d totally be willing to make the sabayon as a sauce to top an actual dessert but no, it is not dessert in and of itself.